Taste test: These potato chips were very crunchy, and they had a salt and pepper seasoning that was very mild, even slightly sweet, at first. 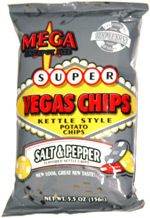 The sweetness seemed a bit odd, as I had never noticed anything like it in other salt and pepper chips. I checked the ingredients, which turned out to include both dextrose and fructose, so that explains it. The aftertaste was more peppery than the initial taste, with no sweetness and a strong black pepper taste that lingered in the back of the throat. Pretty good chips. Smell test: Good fresh peppery smell, not too strong.